Created in 2000, Caplin Systems, www.caplin.com has around 125 staff, is privately held and head-quartered in London with offices in New York and Singapore. Caplin provides technology for building multi-product web trading applications and single-dealer platforms that run in a standard browser. Single dealer portals (SDPs) are the online equivalent of the traditional voice relationship between a bank and its customers. An SDP is to voice trading what Amazon is to a bookstore. As such, SDPs are among the most powerful and competitive weapons in the capital markets. With the rapid growth of electronic trading, SDPs have become a vital route to market for all major banks. 60% of all FX e-trading is now executed via SDPs. But building a high-quality SDP from scratch is extremely challenging, and until recently only the very largest banks had the resources to do it. Caplin has been a long term champion of the SDP and has channelled all its experience and expertise in online trading to create a multi-layered framework that slashes the cost and time traditionally required to build a multi-asset SDPs of unlimited complexity. Trading platform agnostic, easy to integrate, customise and extend, Caplin technology brings SDPs within the reach of banks everywhere. Leading regional banks such as Standard Bank, ANZ, Unicredit, Jyske, Crédit Agricole and TD Bank have succeeded in creating highly effective online trading offerings thanks to Caplin’s unique framework. At the same time, giants like Citi, Barclays, RBS and Nomura have harnessed it to enhance what even they can achieve. We estimate every day over 100,000 end users rely on Caplin. While immensely powerful, and backed by every major software company in the world, HTML5 does not traditionally offer the modularity, scalability, performance or ease of development of more mature technologies such as Java or .Net. I In order to allow banks to take advantage of the huge benefits of HTML5, we have spent over seven years of R&D developing a suite of products that stabilise HTML5 and create a developer environment for creating enterprise scale web trading apps. 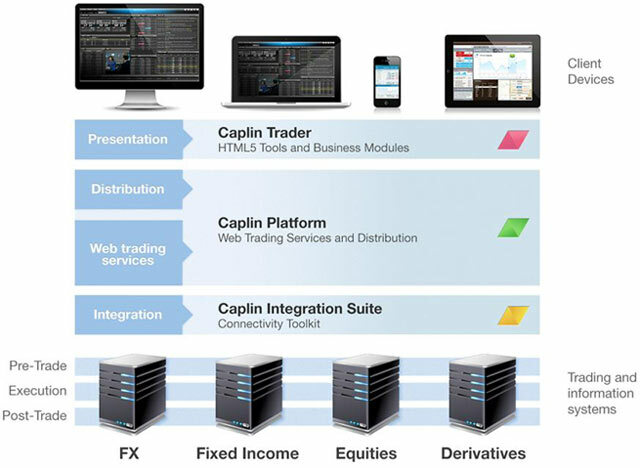 Caplin Trader a production ready web trading solution built entirely in HTML5 enables the fast deployment of enterprise scale trading apps for both desktop and mobile use. The Caplin Platform provides all the processing and distribution capabilities for online trading. It supports all client technologies and asset classes and is the lowest-latency and highest-performing online trading platform currently available. The Caplin Integration Suite (CIS) is a set of libraries, tools and adapters that enables banks to connect a wide range of existing back-end systems to their SDP in days rather than months. BladeRunner brings revolutionary productivity, quality and maintainability to enterprise-scale HTML5 development. Based on a simple but powerful set of programming conventions, it allows rapid development of reusable modules (blades) which can then be combined into sophisticated apps.